These are entry-level managed switch products. 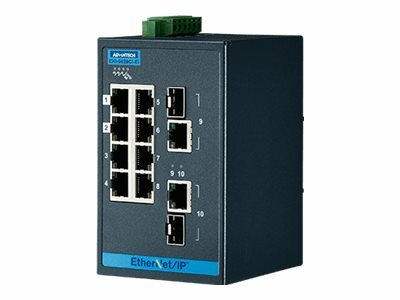 They support the EtherNet/IP protocol to communicate with Ethernet/IP based PLCs. Advantech also provides the FactoryTalk View compliant faceplate, so users can easily integrate the switch with Allen-Bradley PLCs. "Electronic Data Sheet" (EDS files) are also available for users to customize faceplate. The devices come with a compact metal housing that is IP30 rated to protect against dusty industrial environments. The wide power input power (8.4 to 52.8 VDC) is dedicated to operating in areas of unstable power and rugged environments.